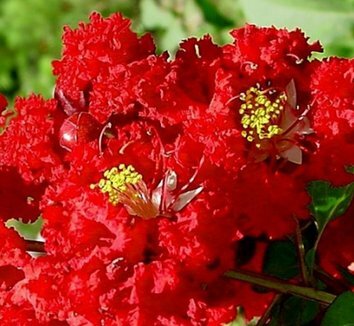 "Dynamite" Crape myrtles are very good trees especially in warm areas. They bloom even when other trees have stopped due to the heat and humidity of the summer. These trees are medium sized and bloom with bright red flowers. They bloom up to four months at a time. They are easy to grow, fast growers and don’t require much attention. When planted in groups or as a specimen, these trees look fantastic. They are normally used for landscape beds near the house because they don’t grow big. Their mature height is around 20-30 feet when not pruned. One can opt to prune to maintain a smaller size. "Dynamite" Crape myrtles trees can be planted throughout the year. If you chose to plant in a row, it is wise to plant them ten feet apart. But this is when you are planning to prune. If you don’t want to prune you should plant them fifteen feet apart. They require part to full sun. They don’t have a specific soil that suits them but the soils should be fertile, moist and well drained. Before they are established one has to water them to avoid drying up. But once they have established they can tolerate even dry season. In fact they are resistant to drought, mildew, diseases and insects. They know how to take care of themselves. Maintaining these trees is not hard at all. But it is very annoying when you prune them and after a few days the branches grow once again. They only need to be pruned twice in a year preferably January and February. One can prune them to fit in the vases for easier manageability. For those who would love to get lots of flowers from these trees, you can add phosphate in winter. Come summer and your trees will be blooming with lots of flowers.